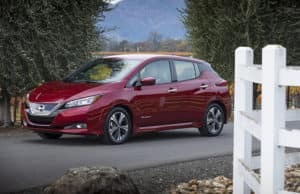 The 2018 Nissan LEAF was awarded “2018 World Green Car” by the World Car Awards during the New York International Auto Show. The 2018 LEAF was also a top-10 finalist for the World Car Awards’ “2018 Wold Car of the Year”. Winners were announced during the 2018 New York International Auto Show, which runs through April 8. The LEAF represents the first all-electric car to take the “World Green Car of the Year” award since the category’s creation in 2006. The World Car Awards began in 2005 and consists of more than 80 international automotive journalists from 25 countries. 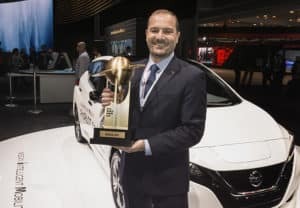 Dan Mohnke, Nissan’s senior vice president of sales and marketing, accepts the LEAF’s “2018 World Green Car” award during the New York International Auto Show. In order to be eligible for any World Car of the Year awards, a vehicle must be sold in at least five countries and at least two continents. The LEAF is marketed in the United States, Japan, Canada, the United Kingdom, and parts of Europe. As of January, more than 300,000 LEAFs have been sold worldwide since its inception in 2010, making it the planet’s all-time best-selling highway-capable electric car. The bulk of these sales, more than 114,000, occur in the United States. Upwards of 72,000 LEAFs have been sold in Japan and nearly 68,000 are found throughout Europe. This year marks the second time the Nissan LEAF has earned recognition from World Car Awards. The LEAF received the group’s highest award, “World Car of the Year”, in 2011. It remains the only all-electric vehicle to take that award in the organization’s history. Nissan is no stranger to the World Car Awards. In 2009 the GT-R beat out the Chevrolet Corvette ZR1, the Porsche 911, the Lamborghini LP560-4 Gallardo and several other sports cars to win the “World Performance Car” category.